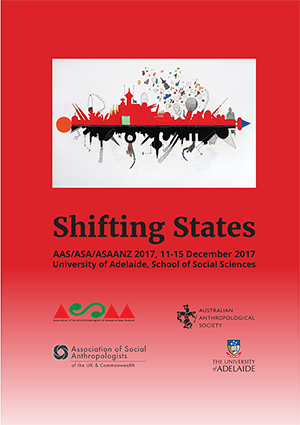 Over 500 anthropologists from across Australia, New Zealand, the UK and Commonwealth and beyond, came together in Adelaide for the annual conference of three anthropology associations (AAS, ASA and ASAANZ). Use the navigation to read more about the exciting programme, including the theme, daily timetable and panels. Learn more about the Screen/Media/Art strand and the many anthropological (and some wine-related :-)) Events which took place during the conference. Delegates can download receipts as signed, headed PDFs, from the login environment. Delegates can also download certificates of attendance in a similar fashion, after the conference has concluded. The following presenters/convenors listed in the printed/PDF programme subsequently withdrew: Cabayao (P18), Cahn (P44), Das (P14), Fors (P16), Groizard (P18), Hill (P14), Johar (P45), Kasi (P45), Langsford (P16), Lanzeni (P16), Lim (P04), Mohanty (P45), Ngulube (P40), Osz (P16), Pink (P16), Sabharwal (P14, P44), Singh (P45), Suyadnya (P12), Szymanska (P27), Trindade (P28). This can be downloaded as a PDF. Richard is Senior Lecturer in Anthropology and Development Studies at the University of Adelaide. His research focuses primarily on the African Great Lakes region, especially on the societies of South-western Uganda, where he has been conducting ethnographic fieldwork since 2000. He has written extensively on this region, including on: post-conflict reconstruction; iconographies of nationalism; media and social change; the anthropology of corruption, and; the politics of development (education, governance and infrastructure). His recent publications include: Photography in Africa: Ethnographic Perspectives (2012); Media on the Move: Ethnographies of Communication and Connectivity in Sub-Saharan Africa (with Katrien Pype, 2016) and; the NRM Regime and the 2016 Ugandan Elections (with Sam Wilkins, 2016). Alison is an anthropologist with extensive and long term field research in rural Papua New Guinea, and recent research online. Dundon has published on: sexual and gendered health and HIV/AIDS; the anthropology of Christianity and ancestral and environmental spirituality; community development and engagement with the state; art, material culture and cultural tourism; space, place and dance; embodiment, emotion and the senses, and; gendered violence. More recently, she has focused on online interactions, particularly online dating, love, intimacy and well-being in both PNG and Australia, and on the use of mobile phones in rural PNG.